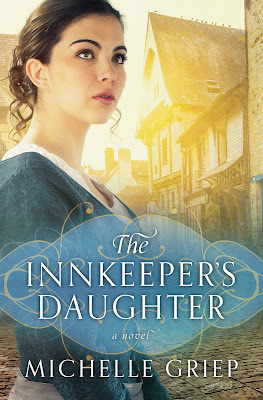 Celebrate Lit Tour & Giveaway: The Innkeeper's Daughter A Suspenseful HIstorical Novel A Must Read! Dover, England, 1808: Officer Alexander Moore goes undercover as a gambling gentleman to expose a high-stakes plot against the king—and he’s a master of disguise, for Johanna Langley believes him to be quite the rogue...until she can no longer fight against his unrelenting charm. Michelle Griep has done it again! Captured a tale by the stroke of her pen. Alex and Johanna definitely share a bond that began when she literally landed in his arms. No small fete for this couple to meet and fall in love in the midst of a man on a particular mission. His duty to the crown was foremost on his mind yet this woman and her family captured his heart and he knew he needed to remain focused on his task. This book has all the elements of a suspenseful thriller rivaling anything that we can see on the big screen. When I read this book I felt as if I were transported back to England in 1808. As a woman I felt powerless to try to improve the lot of Johanna and her mother as they worked their fingers to the bone to keep their ramshackle inn afloat. No matter what they did it was hard to keep up with their rent. It was a wonder why a classy gent like Alex was commanded to stay at this inn at this time. Patience, dear reader for all will be told in one neatly tied package at the end. I think Michelle Griep created fascinating characters for this book. I was surprised to learn the identity of the traitor. There were, after all, some pretty unsavory characters in this book. You will go deep into the gaol and gamble with high stakes with a Viscount. The drudge of day to day life for those without wealth will grip your heart and hopefully make you grateful for all that you have. Alex had a deep faith and shared that with Johanna in one of her dark moments. When confronted with seemingly hopeless events, she relied on that faith he helped her reawaken. It surprised me that Alex possessed such a deep faith with all that he had been through in his life and his current lifestyle. I appreciated this book all the more with his conviction and how it truly helped them all in the end. Alex desperately wants to help Johanna, especially when she confides in him, but his mission—finding and bringing to justice a traitor to the crown—must come first, or they could all end up dead.It’s a race against time for them both. Tea Shop mystery for her fans! 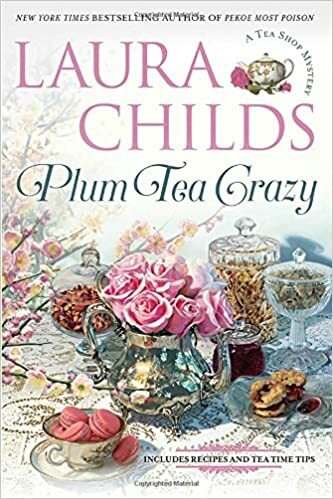 New York Times best selling author Laura Childs delivers, once again in this cozy tea shop mystery. She has a lively cast of characters all laid out like the fine china in Theodosia's lovely tea shop. Time and again the real killer leads us on a chase through dark alleys and dilapidated old neighborhoods. I was intrigued by the red herrings that stole the limelight for a while until each lead ran to nowhere. The glamorous persona of the ladies of the story sharply contrasts to their behavior when confronted with ugly truth and suspicions about the deceased. The victim's soon-to-be ex-wife seemed a likely suspect but so did his purported paramour. Then there was the shady developer...the list just went on and on until finally the pieces fit together like the perennial puzzle. It took me a while to solve this one and for that, I applaud the author. I have read several of the Tea Shop Mystery books, each one a creative story that provokes one to put on the teakettle, grab a tasty morsel and settle in for an afternoon of fun. The tea pairings offered by Drayton lends such an air of class to the charming menus, yet contrasts with the danger lurking just outside the confines of the door. The variety of characters in this story takes away any doubt that a tea shop is just for garden club members or those tourists seeking a bit of distraction before the tour bus loads up for the next stop. This book is for the reader who enjoys a cozy mystery with the added bonus of tasty recipes the author included. "Determined to protect the children of Teaville, Kansas, from the bullying she experienced as a child, Mercy McClain finds fulfillment working at the local orphanage and serving on the school board. When Aaron Firebrook, the worst of her childhood bullies, petitions the board for a teaching position, she's dead set against his getting the job. Aaron knows he deserves every bit of Mercy's mistrust, but he's returned to his hometown a changed man and is seeking the forgiveness of those he wronged. He doesn't expect Mercy to like him, but surely he can prove he now has the children's best interests at heart. Will resentment and old wounds hold them back, or can Mercy and Aaron overcome the past in time to battle the threats against the future of the town's orphans?" 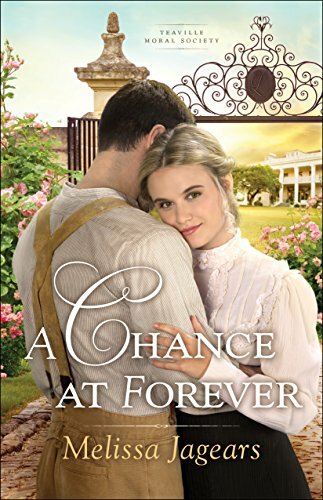 I really looked forward to reading A Chance at Forever because for several years I have been a fan of Melissa Jagears writing. 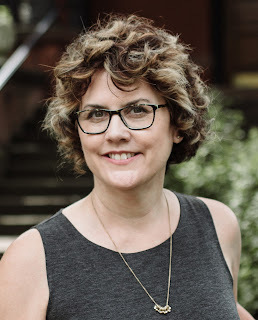 So it was no surprise as I eagerly opened the book but she had me hooked right on the first page, at "...the thick scent of lemon cleaner overpowered the powdery smell of the chalk dust they disturbed as they walked through sunbeams." I was immersed immediately into the story. A Chance At Forever is such a powerful story of one man's quest to be truly forgiven for the hurt he inflicted on others as the class bully at school. A reputation that made others cringe when they came to realize that Aaron Firebrook was actually George Firebrook. Such treatment of others is sinful but who ever thinks that their bully would come back later not to taunt them but to ask forgiveness. That is just what Aaron Firebrook set out to do and what Melissa Jagears masterfully writes about in this book. Time after time the pain he caused in his youth reflects back to remind him of just how much he hurt others. His hopes of becoming a teacher to help right his wrongs may not come to fruition if the lone woman school board member has any influence on the matter. It is much more than just a story of forgiveness though; it is a love story of the highest order. Where loving the unlovable seems far fetched. A romance between a skeptic who never allowed herself to even dream of love because by accident of her birth she was given just one hand. A beautiful woman in all regards with no shortage of love for the children in her care at the orphanage. Mercy McClain would always remember George, however and now that he was back in Teaville seeking a job as a teacher, she wasn't able to escape when her employer hired him as gardener for the orphanage while he waited for answers on the teaching position. A job she wanted the school board to give to anyone but him. I was impressed by the whole story not just to see how Mercy and Aaron learn to work together under their trying circumstances, but also the children at the orphanage. Most especially Jimmy, whose bad behavior leaves one to doubt if he could ever be adopted, and timid little Owen, who hardly leaves Mercy's side. There is a whole community tied together through this orphanage, founded by Nicholas and Lydia Lowe. 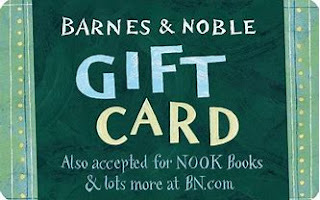 Some of these characters, such as the Lowes continue throughout the series, although each book can stand alone. The characters will touch your heart and the story is one that shows forgiveness can truly happen if we open our hearts to see and listen to each other. I heartily recommend A Chance At Forever by Melissa Jagears. The ways of love can be complex. Sometimes a relationship full of unexpected twists and unlikely turns leads to a bond that's strong and secure. Join Karen Witemeyer, Mary Connealy,Regina Jennings, and Melissa Jagears for novellas that follow the winding path of romance in stories that celebrate a love that lasts forever. The Love Knot - When Claire Nevin's troubled younger sibling sends her an unexpected package by rail, the gift and the man who delivers it--an unexpected face from the past--threaten to upend Claire's life forever. Fighting to hold on to all she has built, will she lose what matters most? My thoughts...I enjoyed Claire and Pieter's story, a test of how far one man would go to prove his forever love. Sometimes what we see may cause heartbreak but if we run away before learning all the facts, we may never know pure joy. Karen Witemeyer's town of Harper's Station, Texas, a town run by women, is the setting once again for a heartwarming romance that will leave you smiling. The Tangled Ties that Bind - Connor Kincaid returns home determined to win the hand of the woman he was too young for when he left. But Maggie is training to be a doctor in a distant town, while Connor's about to settle on a ranch. Will either be willing to give up their dream? Or will they both have to give up the love of a lifetime? My thoughts....When Connor didn't return, Maggie made the decision to create her own life without him. Connor was amazed that she wasn't pining at home for him. Her courage to forge a new life in uncharted waters surprised him. The events that unfolded in this story kept me turning the pages. Mary Connealy wrapped this up as neat as any bow and I was surprised by the outcome! 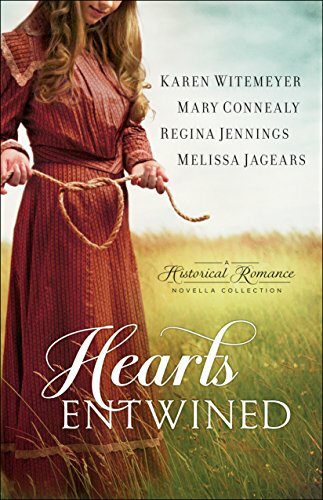 Bound and Determined - As punishment for his recklessness, Private Bradley Willis is sent on an errand to help a retired cavalry officer move a herd across Indian Territory. No one told him the herd would be camels instead of cattle, nor that the officer's headstrong daughter, Ambrosia Herald, would seem to be trying to undermine the whole enterprise. He's definitely been saddled with more than he's bargained for. My Thoughts.... I thought Regina Jennings had a wonderful imagination using camels in the cavalry until I did a little research to the contrary! There was indeed a U.S. Army Camel Corps. The romance between Bradley and Ambrosia began rather testily and I wondered how these two would ever get along when she was determined to undermine his mission and her father's desire to bring home the camels. I enjoyed their banter and how the mission changed them all. Tied and True - Wealthy Marianne Lister is in love with business assistant Calvin Hochstetler, but he can't see past the difference in their social status. When Marianne takes a job to prove that she is prepared for a life of hard work alongside the man of her dreams, will it be enough to convince Calvin to risk it all for love? My thoughts...Melissa Jagears' Marianne, is one determined woman. This story is a twist of romantic tales of the poor young beauty captivating the wealthy bachelor. She fell for Calvin the moment she met him. He thought she was destined to marry David, the boss' son. His one desire was to keep his job and avoid any entanglement that would threaten his security. Playing it safe was his mantra. Marianne and David, friends since childhood seem destined to marry in the eyes of their parents but to each other, not so much. She is not your average spoiled socialite. I enjoyed the development of her character from the beginning of the story. Her determination is admirable and would be a welcome change to many in our society today. The authors of this novella collection put together an entertaining group of stories that I believe any fan of historical romances would enjoy. I appreciate their creativity and the research they did to make this book a reality. I am happy that I was able to receive a copy of this book from Bethany House Publishing in exchange for an honest review.